Do yo have any fishermen in your life? 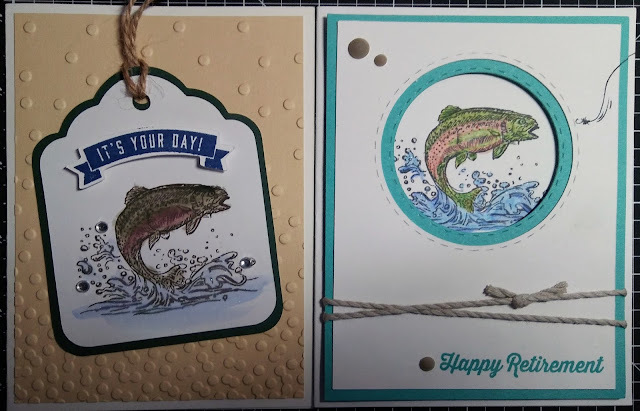 Here's two amazing cards for you tonight using the Hooked On You stamp set B1535. This stamp set was introduced last fall in the Annual Inspirations catalog so it may not be around through this summer. These beautful cards were created by sister consultants Jennifer Palmer (left card) and ???. I don't have her name. Hopefully I'll be able to update this post with her name soon! With joy in my heart and coffee in my cup, have a wonderful day. 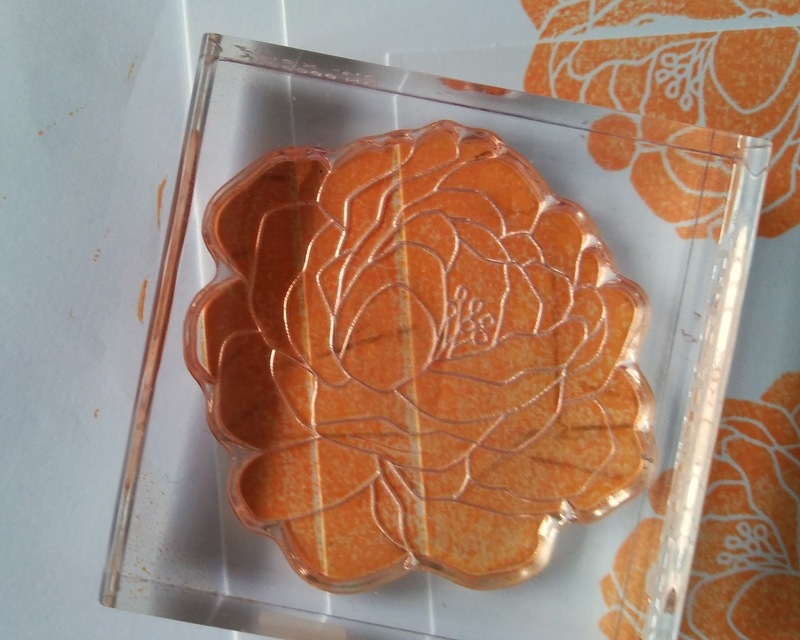 I'd love to introduce you to triple time stamping and give you a peek at the stamp and papers that will be featured next month! This is a technique where you stamp on 3 layers of paper at one time. Hence the name of Triple Time. It looks more complicated than it really is which is my favorite part. On this card, I used the Live Beautifully stamp set for the May 2017 National Scrapbooking Day (or Month) campaign from Close To My Heart. When I first saw this stamp set I knew it would be great for this technique. I like to use a large, fairly solid stamp for this technique because it does require me to push hard to stamp across the 3 layers of cardstock. Usually I tell my friends, "don't perform CPR on your stamp (press down so hard on the stamp that it requires both hands). You'll crush it and it and the image will be blurry." 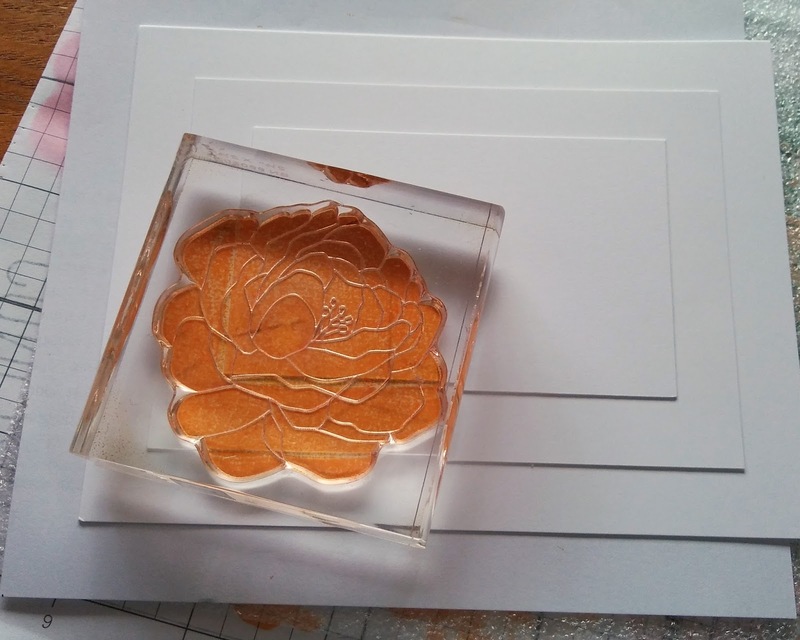 In this technique, you want a sturdy stamp. The stamp set used on this card will only be available May 1 thru 31 of 2017. There's also a beautiful paper pack and scrapbook kit too. Scroll to the bottom to see more. In the meantime, here's a step by step tutorial. There's 2 ways to cut your paper for this. 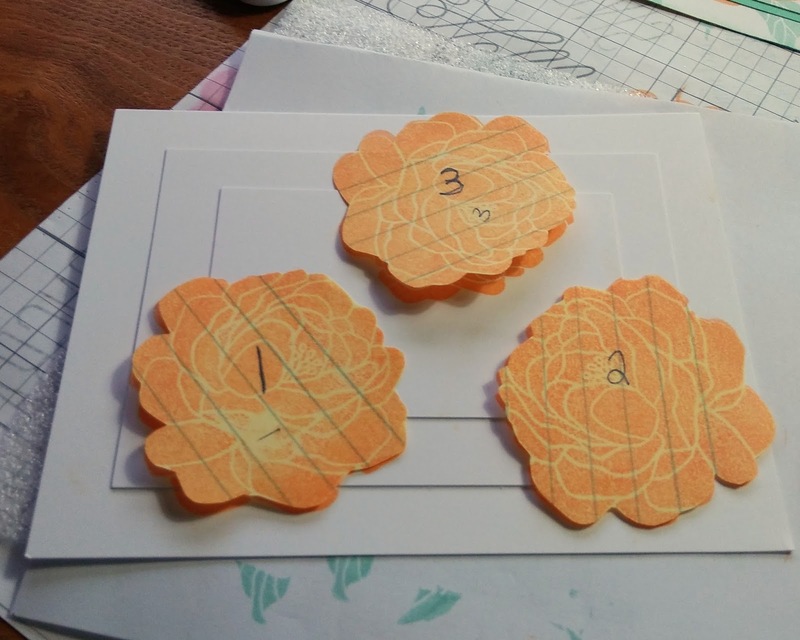 Many people start with a colored cardstock base and build up. Not me. I used a card base. I like my version because it uses less paper and there's more of the stamped image visible. 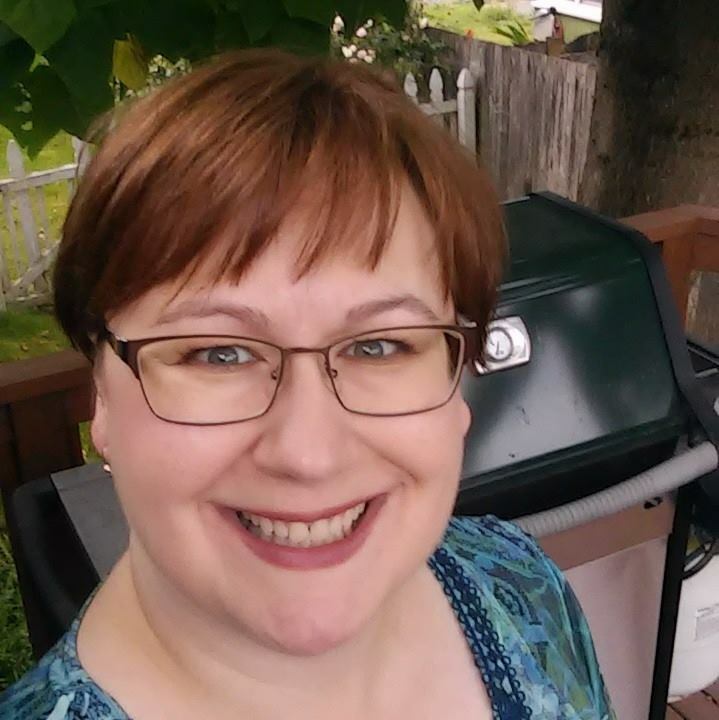 My upline & friend Michele Rowley showed me this trick of using less paper a few years back. I've hung on to her card for years and recently put it in a safe place. Of course that means I can't find it. But I'm pretty sure the dimensions are the same. Notice how each one is 1" smaller? That is key. Knowing this, you can make a card of any dimension. Square ones would be beautiful. Now the colored cardstock/glitter paper. The first one is .25" larger than the second layer of the white cardstock. 3.75 x 2.5. I used glitter paper on this layer. It is also 1" smaller than the cardstock layer above it. Set the colored cardstock side and grab some temporary adhesive. Don't have any? Use a 1/4" of tape runner and rub your finger on it to lose most of its stickiness. You'll be tacking the layers down temporarily. Use just a tiny bit in the middle of each card. I'm serious. A half inch line of adhesive will be plenty. 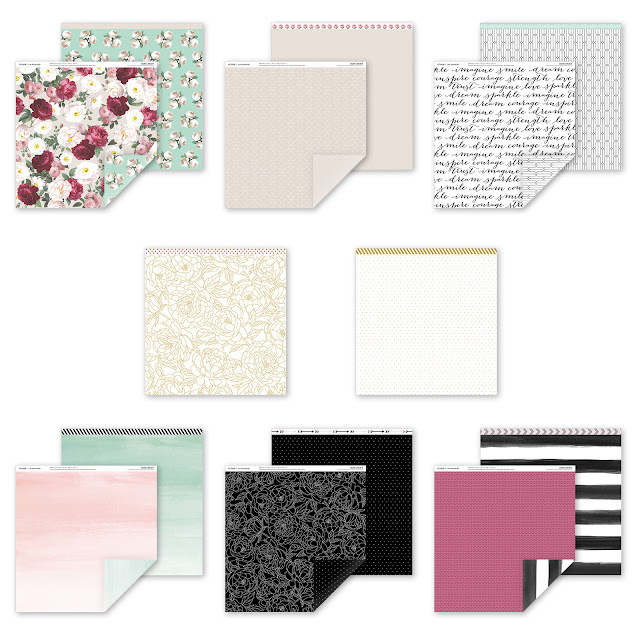 Stack your 3 white cardstock layers. Centering them as they'll be when finished. Some people will tilt their pieces. Let's stick to simple and centered today. Let's start stamping. I like to use fairly large and solid stamps for a project like this. You'll be pressing hard. Like doing CPR. Baby stamps, like infants won't hold up under full chest commissions. I stamp on a solid surface with a piece if foam under the cardstock. I use a scratch piece of paper to protect the foam from ink. Foam doesn't soak up ink. It will smear all over the next thing it touches. 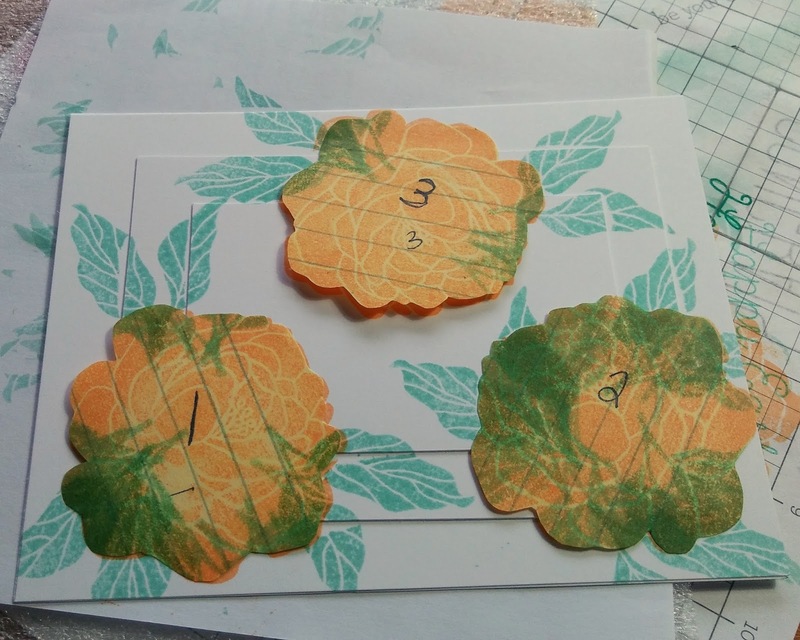 After stamping the 3 flowers, I needed to stamp the leaves. I stamped a mask in a Post-it note and trimmed it out. I was making a bunch of these cards so I made 3 masks and labeled them. I forgot to move the mask and stamped a stem across the flower accidentally. Be sure to go across layers and off of the edge of the card. White space is wonderful. You don't need to fill every bit of the white paper. The last thing I stamped was the sentiment. I didn't stamp across layers for this. I also didn't press hard because it would blur the image. Next I pulled the 3 layers apart and rebuilt my card with the cardstock and glitter paper added back in. I know that my papers are centered but I also paid attention to how the pattern lined up. I used glue dots to adhere the top layer to the glitter paper. Glitter paper is rough and doesn't bond with a flat adhesive that well. 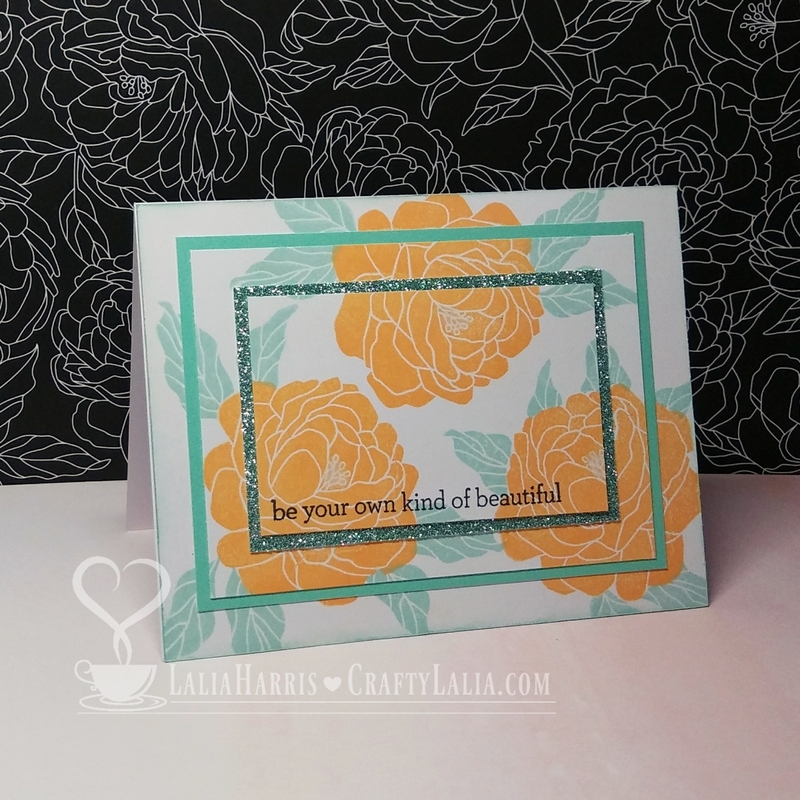 This is a fun and very flat card that mails beautifully. 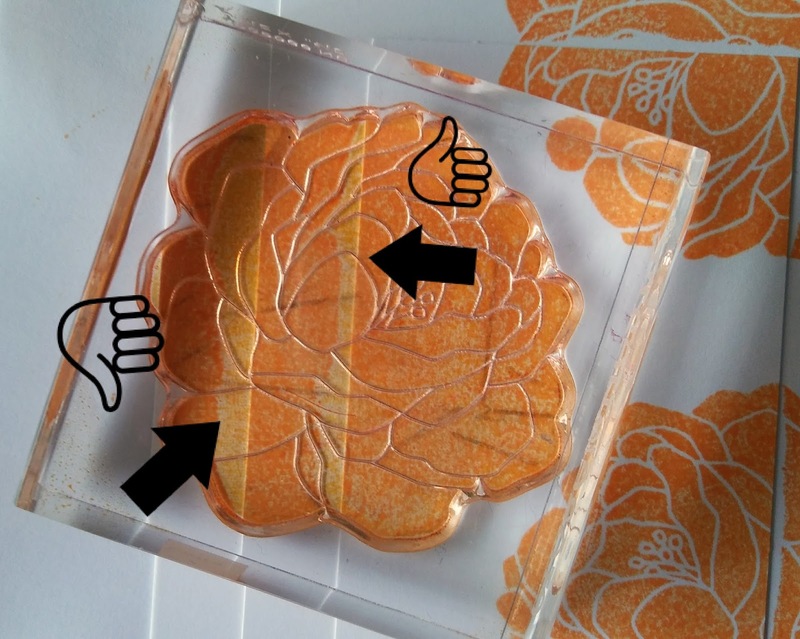 Your friends will be impressed by your stamping prowess. You don't have to tell them our secret. You can let them think you're an amazing meticulous stamper who is an expert at lining things up. Here's what the full stamp set looks like. It coordinated with the paper pack that is also only available in May. In addition, there's a scrapbook kit! 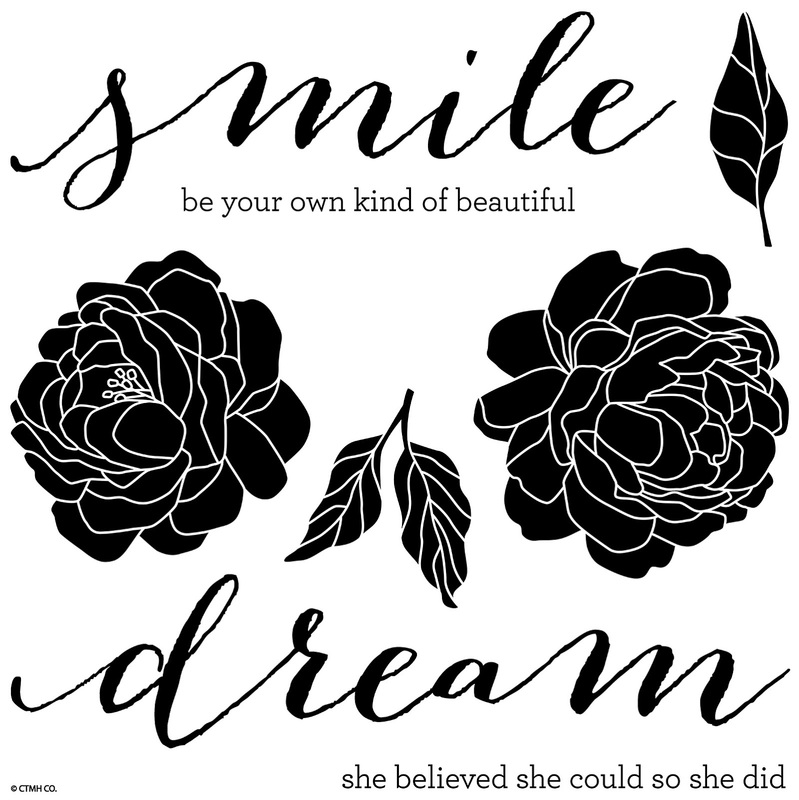 There's pre-cut embellishments and preprinted designs that look like you spent hours cutting and designing. It includes 10 pages to make 5 double page layouts! Each page will actually take only a few minutes to assemble. This kit is available 5/1/2017. With joy in my heart and coffee in my cup, have a wonderful day!